In Star Wars Rebels season one, the best episodes were the ones where our heroes were in action that moved the overall story ahead. The lesser ones were bottle episodes where characters were defined, but the mythology wasn’t expanded. Season two started off with the perfect mix of both. 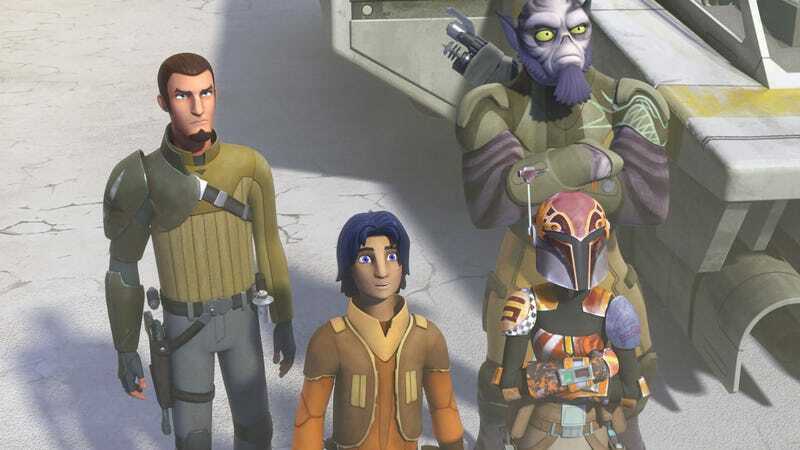 In “The Lost Commanders” (the first episode of the second season after this summer’s mini-movie The Siege of Lothal) Ezra, Kanan and the Ghost crew go to look for a mysterious leader at the suggestions of Ashoka Tano. They find Captain Rex, one of the most popular—and loyal—clones from Star Wars: The Clone Wars. Since that show, several years have passed and Rex has aged, which gives us perspective not only on the passage of time in the Star Wars canon but how everyone has reacted to the fallout of Revenge of the Sith. Rex doesn’t trust the Empire, still loves the old Republic, but is super content sitting on this plane and just chilling. He doesn’t feel like he’s part of the fight anymore. However, upon meeting Rex, Kanan is worried because, you know, the Clones killed pretty much all the Jedi thanks to Order 66. But Rex and his friends, Wolffe and Gregor, removed their chips, weren’t affected and agree to help. They’ll help by giving the Rebels suggestions for places the Rebel Alliance can set up a secret base. However, as payment, they must help the Clones get some food. They use Zeb as bait to catch a Joopa, which is basically a huge worm with the face of a centipede. Think Dune. Then, in a scene straight out of Jaws, the Clones use an electric bolt on their Orca-like Old Republic tank to track the Joopa as he tries in devour Zeb. The result was a crazy action scene that provided a nice nod to the Spielberg classic while simultaneously proving to the Clones these Rebels can be trusted. I’m so glad Star Wars Rebels is back. While The Lost Commanders wasn’t one of the best episodes we’ve seen, it did show how the show is becoming a wonderful hybrid piece of storytelling. There’s lots of off-the-cuff action and hijinks for the kids, but also plenty of mythology and links for the Star Wars hardcores. It doesn’t have to be one or the other, which sometimes happened in the first season. In this episode, we were reintroduced to a fan favorite character Rex, given context to the mindset of the Galaxy, and set in motion a large story of the Rebels continuing to take on the Empire. Not a bad 22 minutes to start the season.